Our families have gathered in large numbers and small on several occasions between 1995 and up to 2004; in addition our main research group of about 12 or so have a practice of meeting over lunch or coffee about three times yearly, usually at Mornington. Any family member is welcome to join in these regular gatherings – just email the site administrator on bonniewm@bigpond.net.au to arrange this. 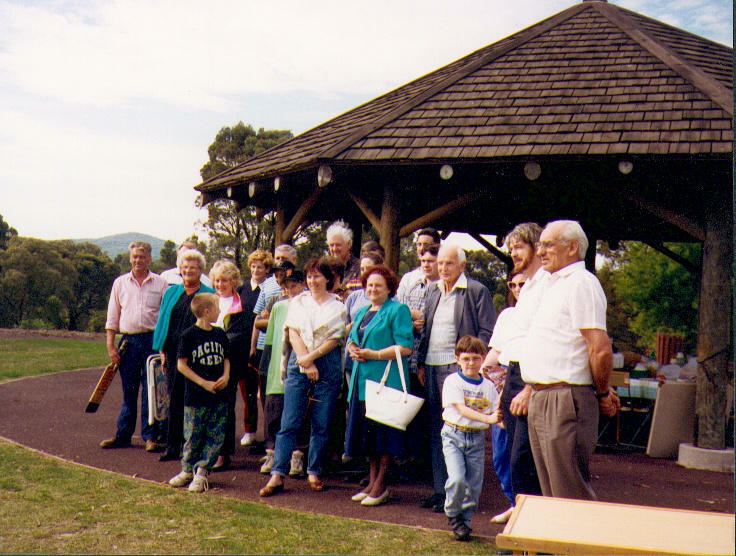 We have had two major reunions, in 1995 and in 2004, each attended by over 200 members of family; the first was at Hastings and the second at Pearcedale. We present here a compendium of photos from each of those two occasions, commencing with the group image below from the Hastings reunion. Our Inaugral 1995 Hastings Reunion – This reunion featured many reams of black and white enlarged text and images drawn mainly from Mike Wilson’s comprehensive ‘Synopsis’ production. Some members also brought along items of family memorabilia and told the group its story. The gathering was jointly MC’d by Laurie and Mike Wilson, with presentations by representatives from the three arms of family – those of the William Sorell, the Frederick Langloh and the John Bowman arms. 2004 Reunion: a Great Success – Sunday November 28th was the day, and Pearcedale Public Hall and Park was the place for our second (in ten years, and probably in 180 years) family reunion of members of Bonnie William and Margaret Wilson’s clan. We recorded the image below of the attendees who again came from several States. Featuring a ‘picnic in the park’ occasion, with the hall set up with displays of the family story photographs and memorabilia, and a set of continually playing audio visual family history displays via DVD. Clearly between 1995 and 2004 our knowledge base and our technology had advanced dramatically and we were able to display so much more, to the enjoyment of all. John Wilson was MC for the day (and a very capable job he did too) and verbal presentations were made by Jennie Towan (The Bridge), Mike Wilson (Rabbit Skins), and Shirley Davies (Why did they emigrate). Jennie’s tale included the story of the Overseer’s ghost, and the 1817 auction by a settler in Hobart of his wife for the exorbitant price of 17 ewes and a gallon of rum; Mike’s was one of pathos about his uncle who didn’t come back from the Great War, and the one who did; and Shirley told us of a ‘dark secret’ which may have been paramount behind William & Margaret’s decision to venture to Van Diemens Land. We had some special recognition for our ‘most mature attendee’ – awarded to Norm Russo (89), and for our ‘youngest attendee’, coincidentally won by Norm’s great great grandaughter, Jai Orlando Joseph (aged 10 months), and one for the furthest travelled attendee, Mal Lanham from 100km north of Brisbane (Mal was also the superorganiser who formed us up for the Group Photo shot – a masterly orchestration). Special feature was the glass cased display of William’s violin, brought by him from Scotland in 1820, and the two little biblical booklets gifted by William to his betrothed Margaret on April 18th, 1820 at Carnoustie, Scotland. The classy glass case and arrangement was compliments of John Wilson – his very own handiwork. And appreciation to Jo in Tassie for graciously making the violin and bibles available for us to see. Small Gatherings from 1993 to 2003 – One of our first small gatherings was in Hobart in 1994 when Shirley Davies and Laurie Wilson had a first meeting with members of the Tasmanian family – seen in the panorama outside the old St Andrews ‘Church of Scotland’ building (now the church hall) below. Finally, below that image is a set of images from several smaller group gatherings over the period.